Using all geo-located image tweets shared on Twitter in 2012-2013, I find that the volume of Twitter data is a valid proxy for estimating current GDP in USD at the country level. Residuals from my preferred model are negatively correlated to a data quality index, indicating that my estimates of GDP are more accurate for countries with more reliable GDP data. Comparing Twitter with more commonly-used proxy of night-light data, I find that variation in Twitter activity explains slightly more of the cross-country variance in GDP. I also exploit the continuous time and geographic granularity of social media posts to create monthly and weekly estimates of GDP for the US, as well as subnational estimates, including those economic areas that span national borders. 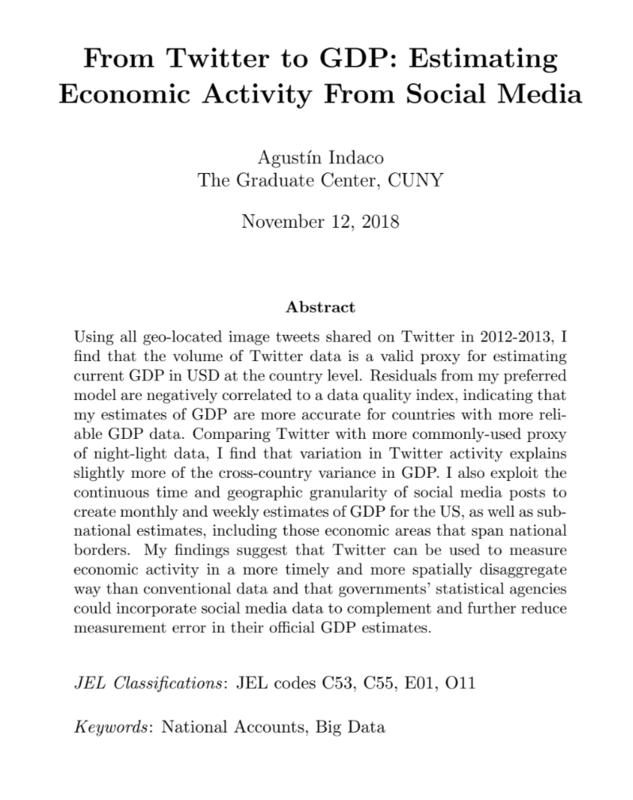 My findings suggest that Twitter can be used to measure economic activity in a more timely and more spatially disaggregate way than conventional data and that governments’ statistical agencies could incorporate social media data to complement and further reduce measurement error in their official GDP estimates. We analyze the role of flood insurance on the housing markets of coastal cities. To do so we have assembled a parcel-level dataset including the universe of residential sales for three coastal urban areas in the United States – Miami-Dade county (2008- 2015), New York city (2003-2016), and Virginia Beach (2000-2016) – matched with their FEMA flood maps, which characterize the flood risk level for each property. First, we compare trends in housing values and sales activity among properties on the floodplain, as defined by the National Flood Insurance Program (NFIP), relative to properties located elsewhere within the same city. 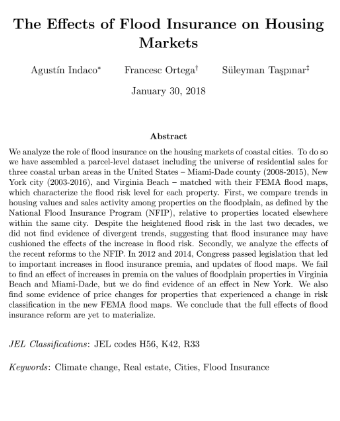 Despite the heightened flood risk in the last two decades, we did not find evidence of divergent trends, suggesting that flood insurance may have cushioned the effects of the increase in flood risk. Secondly, we analyze the effects of the recent reforms to the NFIP. In 2012 and 2014, Congress passed legislation that led to important increases in insurance premia and updates of flood maps. We fail to find an effect of increases in premia on the values of floodplain properties in Virginia Beach and Miami-Dade, but we do find evidence of an effect in New York coinciding with the aftermath of hurricane Sandy. We also find some evidence of price changes for properties that experienced a change in risk classification in the new FEMA flood maps. We conclude that the full effects of the 2012-2014 flood insurance reforms have not yet taken place but will probably materialize in the future. Sharing photos, videos and comments on social media may seem an idle pastime, but it is not without its uses where urban design is concerned. Analysing such posts can yield helpful indicators as to how people experience the built environment. 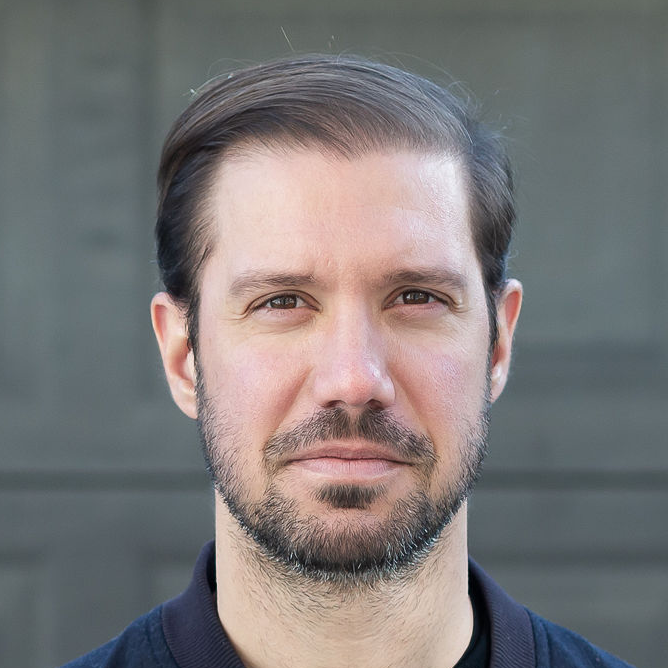 Lev Manovich and Agustin Indaco, of the Software Studies Lab at the University of California, San Diego and the Graduate Center, City University of New York, here outline two of the Lab’s recent research projects, which have involved examining extensive Instagram data from various cities around the globe. Social media content shared today in cities, such as Instagram images, their tags and descriptions, is the key form of contemporary city life. 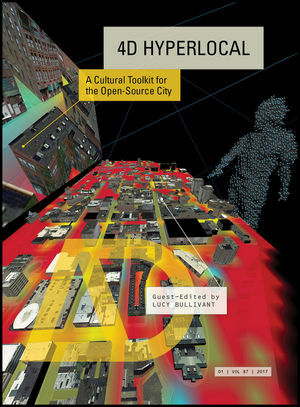 It tells people where activities and locations that interest them are and it allows them to share their urban experiences and self-representations. 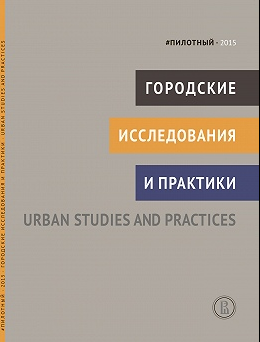 Therefore, any analysis of urban structures and cultures needs to consider social media activity. 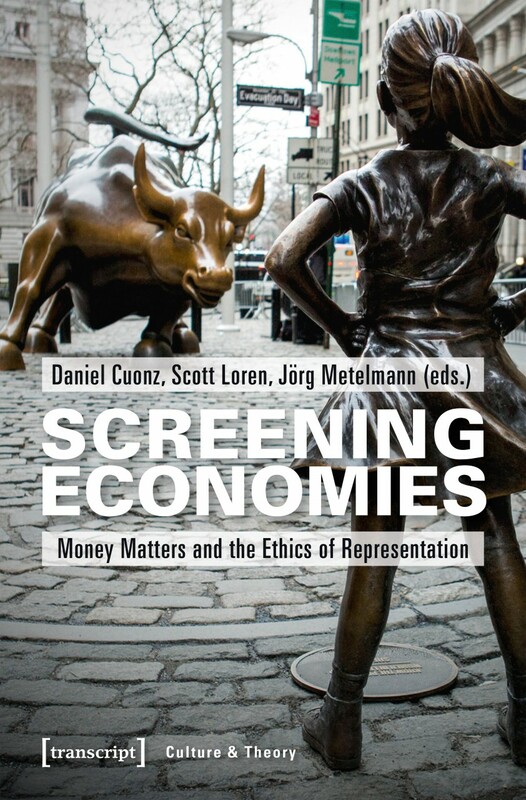 In our paper, we introduce the novel concept of social media inequality. This concept allows us to quantitatively compare pattern in social media activities between parts of a city, a number of cities, or any other spatial areas. Indaco, Agustín and Indaco, Alfredo A. Taking as reference a group of comparable countries, this paper aims to explain the historical evolution and the current situation of Argentina’s industrial development. Industrial development depends a large number of factors and circumstances. In this paper we have evaluated eight of these factors: degree of innovation, bureaucracy , education, investment , spending on research and development, access to credit, technological complexity of manufacturing products and economic benefits from commerce with trading partners . The data presented show that in all these items, Argentina is in a very unfavorable position compared to the other countries taken reference. Necessary reforms need to be made to improve the countries relative performance if it aims to enhance its industrial development. El presente trabajo pretende explicar la evolución histórica y la situación actual de la industria nacional, tomando como referencia un grupo de países que tienen cierto grado de afinidad con la Argentina, o al menos característica replicables. 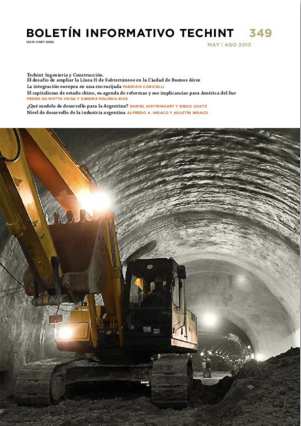 El desarrollo industrial depende de un gran número de factores y circunstancias. En este trabajo se han evaluado ocho de estos factores: grado de innovación, burocracia, nivel educativo, inversiones, gasto en investigación y desarrollo, acceso al crédito, complejidad tecnológica de manufacturas y beneficios derivados de socios comerciales. Los datos presentados muestran que en todos estos rubros, la Argentina se encuentra en una posición muy poco favorable respecto del resto de los países tomados como referencia por lo que deben realizarse los esfuerzos necesarios para mejorar su performance relativa si se pretende lograr el desarrollo sustentable del tejido industrial.